The Merced Theatre, designed by the Reid Bros., was built in 1930 by Golden State Theatres, a dominant circuit in Central and Northern California. It opened on October 31, 1931. It became part of United Artists Theatres in the mid-1970’s and by the mid-1980’s, the original 1,658-seat auditorium had become four screens. The Merced Theatre closed in the Spring of 2002 because of competition from a new stadium theater which opened a block away. In July of 2002, the city of Merced approved the purchase of this theatre for $700,000, half the $1.4 million asking price. According to the Merced Sun-Star it will be managed by the Merced Theatre Foundation, a non-profit agency, renovation work would take at least 3 years and up to $3 million to complete. The theatre is to operate as a community theatre, and it also has street-level shops and upper-level apartments. Only 300 seats were being used in what was screen 2, but this operation closed in 2009. By 2012, the entire theatre has re-opened as a single auditorium known as the Art Kamanger Center at the Merced Theatre. In 1914 there was also a theatre called the Elite operating in Merced. In that year the manager of the Elite, C.H. 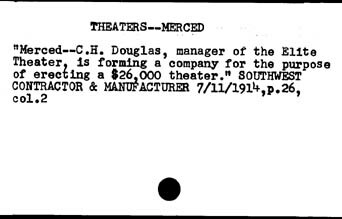 Douglas, formed a company with plans to build a new theatre. Joe pointed out on the Mainzer page /theaters/4405/ of this website that the Strand name appears to have been moved to the former Merced Theatre #1 about 1936. This would make sense to differentiate the older theatre from this present-day Merced Theatre of 1931. Before the previous owner left the theatre, I was able to go through the theatre from top to bottom. This theatre really “got it” from the previous owner. It should be absolutely stunning when it is all put back together. The stage is astoundingly large for a movie/vaudeville house with plenty of wing space. In the orchestra ready room under the stage, I found a couple of what were probably original seat end standards. The Merced Theatre opened on Saturday, October 31, 1931 by Golden State and Realty Company. My parents operated a department store on 17th and K in Merced. As I recall there was a small theatre, The Rio, located on 16th near K, which showed mostly Spanish speaking movies. This was in the late 40s and 50s. A few July 2012 photos can be seen here and here. 1961 photo added courtesy of Keith Ensminger‎.